With over 700,000 log homes in the U.S. and over 30,000 kits manufactured each year; prefab log homes are becoming increasingly popular. A log cabin kit is a ‘turnkey’ home which includes most of the materials required to build a complete log cabin. However, the huge choice of lumber, log types, components and log wall systems can be confusing to someone who hasn’t purchased a log cabin before. This frequently asked questions guide is packed with expert advice, key things you should know and all the different kit types to make sure you’re well informed and ready to purchase a log cabin kit! These materials are sold by dealers as a complete solution to building a log cabin. Purchasing a log home kit enables you to build a log cabin using a pre-designed and step-by-step framework which has been made to satisfy building codes and permits. There are many different ways to customize a log home. A milled kit is where each log has been machine processed with a lathe to the same specification (i.e. uniform shape, diameter and circumference). Each milled log is identical; this gives a cabin a uniform appearance which means the cabin requires limited chinking (more on this below). The logs are typically smooth due to their machine finish. A handcrafted (i.e. bespoke) log home kit is where each log is peeled and scribed (i.e. notched) by hand using a chisel, draw-knife and chainsaw. Each log is unique giving the cabin a rustic and traditional appearance. This provides more customizability and preserves the log’s natural characteristics. A handcrafted kit will cost more than a milled counterpart due to the labour involved. The number of different log profiles, notches, corner types and chinking are vast. The most common milled notch is a chinkless saddle notch (i.e. full scribe). The notch used for a cabin kit will, in some cases, determine the chinking required. Chinking is a material used to create a seal between the imperfect joints of logs. Chinking creates a barrier between a log cabin and the elements to prevent air infiltration and heat loss. Chinking was traditionally made from cement and lime, however, for modern log cabins; chinking is a synthetic ready-made sealant. The average log cabin kit price for a medium sized log cabin is $122,000. When spending that much money it’s important you understand exactly what you are purchasing. Manufacturers use different types of lumber and log profiles, why? Cedar is a premium log. A log cabin kit made from hard-wood will cost ~$15,000 more than a soft-wood alternative. Cedar has a natural ability to withstand weathering and is considered a byword for quality. The log profile impacts the energy efficiency of a log home. The most common log used is a D-Log with a Tongue and Groove notch (this is chinkless). The different types of lumber (discussed above) are initially felled and harvested. Once harvested the logs then need to dry. It’s important that manufacturers dry the logs before building with them to reduce warping, bowing and settling. Wet logs, known as green logs, still have a high moisture content from the water content in the original tree (typically over 40%). The harvested logs are stacked outside, with spacers between each log, and allowed to dry over a period of months to years. The wind and natural sunlight will start and complete the drying process. The harvested logs are initially air dried until around 25-30% moisture content before being moved into a kiln. A kiln is a large oven which is used to accelerate and control the reduction of moisture content. Kiln dried logs are more expensive as the process is very energy intensive. It’s important that whatever process is used to dry the logs the logs are around 10% moisture content before building. When selling a log cabin kit, a manufacturer will also provide construction plans, a cut-sheet and a materials checklist. Stamped blueprints are typically only included from premium manufacturers. Stamped blueprints are required by local municipals as part of building codes for structural engineers to assess your log cabin. Typically, stamped engineering plans cost between $1-$2 per square foot if they aren’t included in a kit. Dealers: Where should you buy a log cabin kit from? There are over 300 manufacturers and dealers in the US. 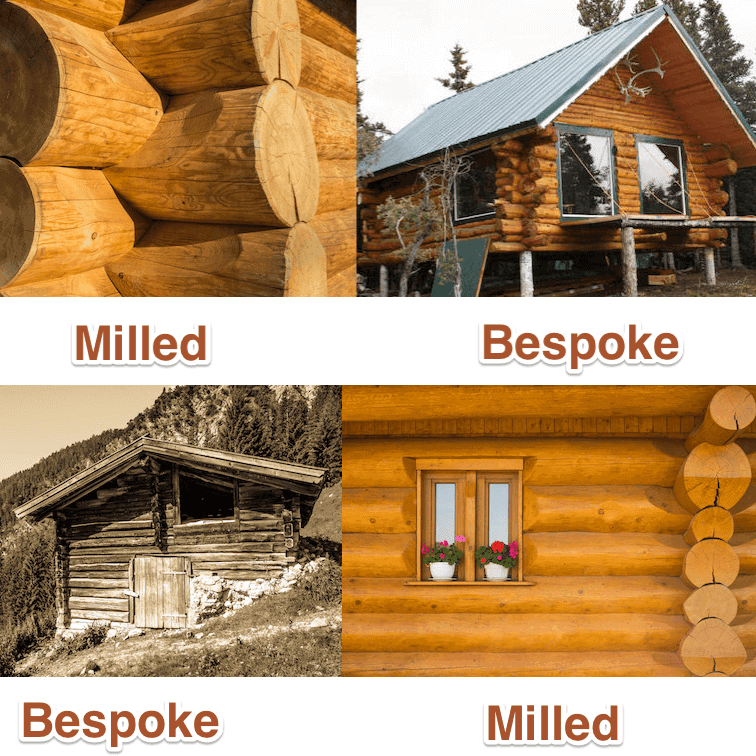 Not all prefab log homes are born equal… and neither are the manufacturers and suppliers. You should perform checks on your chosen manufacturer. Is the manufacturer registered with an association? Does the supplier offer an installation service or on-site assistance? Are the logs and blueprints graded and stamped? Most good quality kit manufacturers will be registered with Log Builders’ Associations or Home Builders’ Associations. You should make sure your kit manufacturer is too. You should expect a minimum 10-year warranty caveated by a maintenance schedule to adhere to from your kit manufacturer. What is Included with a Typical Log Home? When purchasing a kit, you should thoroughly research and understand what is included. After surveying the top 100 kit manufactures in the US we discovered that typically, log wall systems, roofing systems and windows and doors are all included. These materials will provide you with a complete log cabin shell. You should read this section in conjunction with the cost section (above) for a full understanding of cost. It is always clear the price you will pay for your log cabin? What’s the total cost of building the log cabin kit? Not just purchasing the kit. The kit cost is the price typically quoted by the kit manufacturer. The typical price of a log homr measuring 2,200 square feet is $122,000. This is all you will have to pay for your log home. WRONG. It’s better to use a working ratio of 1:3 ratio (excluding labor) or 1:2 ratio (including labor) when purchasing a prefab log home kit. A log home kit which costs $50,000 would cost $100,00 if you build-it-yourself and $150,000 if you pay someone to build it for you. The manufacturing time is how long it will take the supplier to manufacturer your kit. If the kit is cheap the manufacturer may have some in stock. For larger log cabin kits (over 1,500 square feet) the manufacturer will build them on request. This can typically take 3 weeks. The assembly time is how long it will take a full-time contractor to assemble the cabin kit from scratch. This can vary from one or two weeks to one or two years and is driven by contractor experience and the size of the kit. If you are using a contractor expect this number to be weeks or months. If you are assembling the cabin yourself expect this to take a minimum of three months. Building Insurance is an insurance policy to cover your log cabin, fixtures and fittings. Contents Insurance is an insurance policy to cover everything that isn’t fixed down in the log home. Some examples of which are TVs, Laptops, Phones, Furniture and Carpets. Site Insurance is a policy to cover you during the construction phase from things sure as theft and damage. Typically, building and contents insurance are purchased as a single policy. Site Insurance is a specific insurance policy which will need to be purchased separately. Why Do I Need Log Cabin Insurance? If you are planning on financing your log cabin (i.e. taking out a mortgage) then you will need to have building insurance. This will typically be included as a condition of the agreement. However, having insurance will protect you and your cabin from unforeseen emergencies. From materials being stolen to a natural disaster or a malicious attack, you need to make sure you and your log cabin are covered by a reputable insurance provider. How Much does it Cost to Insure a Log Home? Where Can I Find Cheap Log Cabin Insurance? Log Homes are considered a non-standard build to certain insurance providers. It’s important you, as a homeowner, fund an insurance provider that understands log homes and their unique characteristics. The most common form of financing is a construction loan. This is a short-term loan (less than 24 months) which is used to finance the build phase. A construction-to-perm loan automatically converts to a mortgage upon completion of your build. I worked for Cal-Cedar Homes in the late 1970’s, out of Sebastopol California. No problems. People always seemed pleased with their log home. Always have someone build it for you. Simple things like making sure the logs anchored to the foundation are totally square can be crucial.